The Gardens Trust has recently published a guidance leaflet as part of a programme of working with partners in the heritage sector to provide accessible information which will facilitate the process of determining when proposed developments and associated planning applications may impact on a historic designed landscape or its setting. This leaflet explains the place of historic designed landscapes in the planning system, the importance of assessing significance, the statutory consultation obligations and the role of the Gardens Trust and the County Gardens Trusts. You can download a copy of the leaflet here. 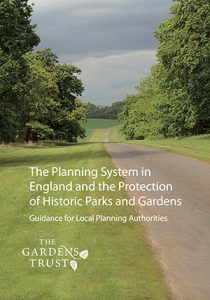 The Gardens Trust is also now custodian of a series of advice notes created by the Garden History Society which provide information about the general planning framework in relation to historic designed landscapes, as well as more specific advice relating to the planning and conservation considerations when particular forms of development or change of use are being considered. Issues covered include telecommunication developments, golf in historic landscapes, educational or institutional development, CCTV and lighting, and management plans. You can download the complete set of notes or individual sections as listed below. All are in PDF format, and are currently being rewritten to bring them up to date with current legislation. We hope to post the newer versions soon. Responding to many requests by County Gardens Trusts, the Gardens Trust Conservation Committee has produced two template letters which Trusts may wish to use as a basis for responding to planning applications or other development proposals affecting designed landscapes in their area. These letters can be freely downloaded as required. English Heritage produces guidance and policy on all aspects of managing the historic environment: Register of Parks and Gardens Selection Guides. It is also accessible through: www.helm.org.uk.